Recently, I saw the movie Nebraska, in which an older gentleman named Woody Grant receives a sweepstakes letter suggesting he might be a million dollar winner. Woody's family warns him that this is a scam; nevertheless, Woody determines to do whatever it takes to get to Nebraska to claim his prize (even if this means walking all the way from Montana). Father, mother, brother & cousin. Woody’s indomitable spirit made me think about the concept of ikigai, a Japanese word that roughly translates as something to live for, or reason for being. For Woody, whose aged body and mind reveal the long-term effects of alcohol abuse, getting to Nebraska wasn’t just about the prize. Rather, it was about striving towards a significant, larger-than-life goal. Getting to Nebraska represents Woody's ikigai. Ikigai is integral to life satisfaction no matter what age you may be. Even so, it is more challenging for older persons when goals are besieged by a myriad of obstacles such as health issues, loss of loved ones, and financial difficulties. My own immigrant parents have had many dreams, and also experienced great disappointments due to illness, loss of income, and family discord. 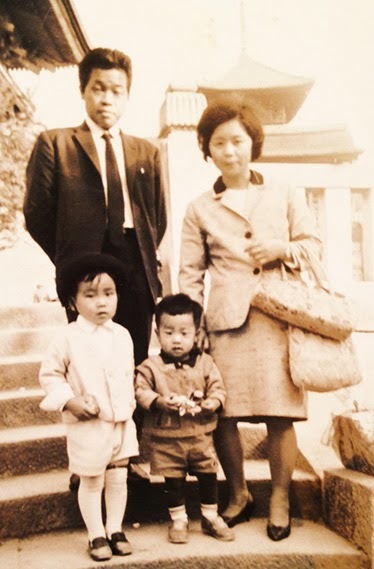 Despite hardships, my parents courageously pushed themselves to get up everyday and to move forward. My Buddhist mentor Daisaku Ikeda, who turned 86 this past January, states, “This lifetime will never come again…to live without regret, it is crucial for us to have a concrete purpose and continually set goals and challenges for ourselves…” Are we ever too old for dreams? For me, the answer is no, but I would be interested in hearing your thoughts and comments. Thank you for taking the time to visit my blog. The other day, a neighbor gave us lemons from her lemon tree. It was perfect timing because I had intended to make lemon bars to honor the 4-year anniversary of my father's passing on January 15 (which is today). Why lemon bars? Well, lemon pie was my father's favorite dessert, and occasionally, I would bring this treat when I visited father in the nursing home. When lemon pie wasn't available at the bakery, I would bake lemon bars to substitute. Luckily my father did not seem to mind, and I can still visualize the the joy on his face as he enjoyed his lemony delight. With the progression of dementia, father's vocabulary became limited. Interestingly, lemon pie was one of the few phrases he never forgot, and he often reminded me to bring his favorite treat on my next visit. As time went on, I brought lemon bars more often than pies because it was simple to make, but nonetheless delicious. Father's favorite part was the tart, lemony filling. 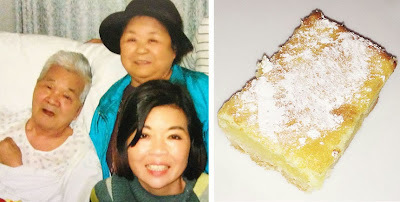 My father, mother and me next to the lemon bar (made with love). My paternal grandfather was an actor who provided for his large family through operating a neighborhood bakery. Not surprisingly, my father grew up eating sweets and continued to enjoy them throughout his life. My grandfather's bakery in Japan did not have lemon pies, so it seems father discovered them when we moved to the U.S. I never asked him why he loved lemon pies over every other sweet, but it is one of the details about my father that always makes me smile. The well-known adage suggests, "when life give you lemons, make lemonade." In my case, I make lemon bars. In doing so, January 15th feels more bearable as I reminisce about the many happy moments I shared with my wonderful father.